Iran’s former representative to the Organization of Islamic Cooperation (OIC) Sabah Zangeneh has, in an article published in the Persian-language E’temad daily, weighed in on the Iranian foreign minister’s recent visits to Oman and Qatar, and the challenges which exist in Tehran’s relations with the two Arab states. The full text of the opinion piece follows. Iranian Foreign Minister Mohammad Javad Zarif’s trip to Oman and Qatar can serve as a giant step toward promoting political, economic and trade ties between Iran and its southern neighbours. 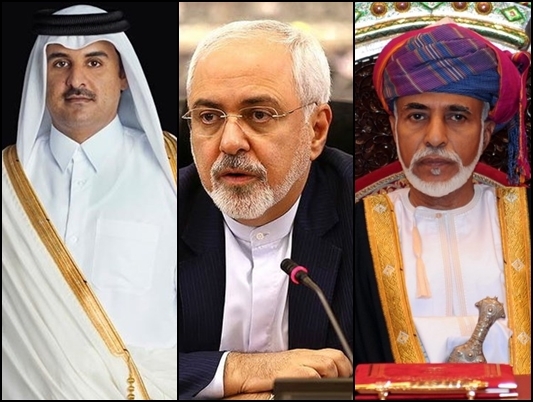 However, there are challenges and obstacles to the enhancement of all-out relations with Doha and Qatar the removal of which requires serious determination and practical action by senior officials in Tehran, Doha and Muscat, so that Qatar and Oman can turn into Iran’s biggest trade and economic partners in the Persian Gulf and the Sea of Oman. Oman can definitely be a good partner for Iran, but it needs careful study to find out whether or not it can turn into a major trade partner for Iran in the future. On the one hand, Omani authorities’ executive capabilities should be assessed. On the other, the determination and seriousness of Iranian officials should be gauged as well. One of the major and strategic issues in Iran-Oman relations is that of cooperation in the field of energy. The issue still is not settled between Iran and Oman’s Oil Ministry. Both sides should have a steely resolve to settle the issue. The president should dedicate more time to the issue; the Iranian Oil Ministry should give up some of its pedantic behaviour; Omani officials, especially the oil minister, should act based on the orders of the country’s king and take serious and practical steps toward getting Tehran-Muscat cooperation in the field of oil and gas to bear fruit. There is much greater potential for the enhancement of Tehran-Muscat trade ties than what has been realized so far. Relations will not expand with the trade conducted by one ship in a week. The officials of both countries need more serious determination to help boost relations on all fronts. Omani ministers usually act upon orders by their king, and drag their feet when there are no orders by the king. These are realities which should be taken into account in relations with Muscat. The development of the Chabahar port in southern Iran has got nowhere for years and very few steps have been taken in that regard. The reasons behind the pause in the development of Chabahar should be identified. It is necessary to establish a robust base in Chabahar through which Iran and Oman will be able to begin long-term cooperation with India, Japan and all other countries in South and Southeast Asia. With foot-dragging and killing time on the implementation of major projects without the provision of such mechanisms, Oman seems unlikely to be able to turn into a major trade partner for Iran. And Qatar is no exception. Tehran and Doha have been discussing the issues of water, energy and joint oil and gas fields. Cooperation between Iran and Qatar at this level can bring about a serious overhaul in the region and even across the world. Reaching such a level of cooperation requires perseverance, rationality, farsightedness and a proper understanding of realities and developments in the region. One of the major challenges is that Iranian trade firms have not been registered in Qatar. Development of trade between Tehran and Doha without having a registered base in Qatar will look like a joke. All these dimensions should be taken into account, so that we will witness serious cooperation and, in the future, stronger unity between the regional countries in a bid to promote development, welfare, stability and security in the region. With the experiences which exist in mutual relations, I hope we will be able to weather these challenges. If the Iranian foreign minister’s recent trip to Qatar and Oman can serve as a positive step toward creating a strong determination in the officials of both countries to remove the existing obstacles, it will definitely contribute to the further cementing and development of reciprocal economic ties. Zarif’s trips are the first visits to the two countries after a crisis emerged in relations between some members of the [Persian] Gulf Cooperation Council (GCC) and Qatar, and the blockade imposed on the country by its neighbours. Naturally, given the recent developments, especially after Saudi Arabia tried to trigger a coups d’état in Qatar and the support for such a coup by one or two members of the Al Thani family, Qatar has adopted a more serious decision than before to overhaul the formation of its foreign relations. Over the recent months, we have been witnessing that Saudi Arabia has been moving toward hatching plots and seeking to bring about a regime change in Qatar rather than going for dialogue. Naturally, such an approach would not be acceptable to Qatar or any other country. Zarif’s trip to Qatar has several dimensions, namely bilateral and regional issues. It seems unlikely that the trip and growing relations between Iran and GCC member states will prompt Saudi Arabia to change the logic behind its relations with GCC members. Riyadh continues to bang the drum for hegemony in the region and is moving toward that end. It is a foregone conclusion that Saudi Arabia will pursue the same policies vis-à-vis other GCC members, including Kuwait, Oman, and, in the future, the United Arab Emirates, and all these countries will be at the mercy of Riyadh’s insatiable appetite for capturing countries or attacking and besieging neighbouring countries. Naturally, bilateral issues between Iran and Qatar, namely the promotion of mutual trade, cooperation in the field of energy, and trilateral regional cooperation between Iran, Qatar and Turkey can be also on the agenda in the Iranian foreign minister’s talks. The gains made by the Iraqi military and government as well as by the Syrian army and government in fighting ISIS and other terrorist groups can also be discussed. Probably, Erbil’s position on the referendum held on the secession of the Kurdistan region from Iraq and efforts to disintegrate Iraq will also be an issue of mutual interest for bilateral talks both in Doha and Muscat. Unity and cooperation are ideals which all countries are pursuing. These ideals have, so far, been met with negative reactions and, at times, ended in failure. However, given the numerous experiences in the region, it seems that it is time to highlight the reasons behind these failures and blows to unity and cooperation. Everyone should understand that if the contributors to failures and disruption of unity and cooperation in the region are identified, one can more easily hope that unity will emerge among regional countries and even between countries in the Middle East and those beyond the region and that such cooperation will lead to regional development and the welfare of the people in the region.